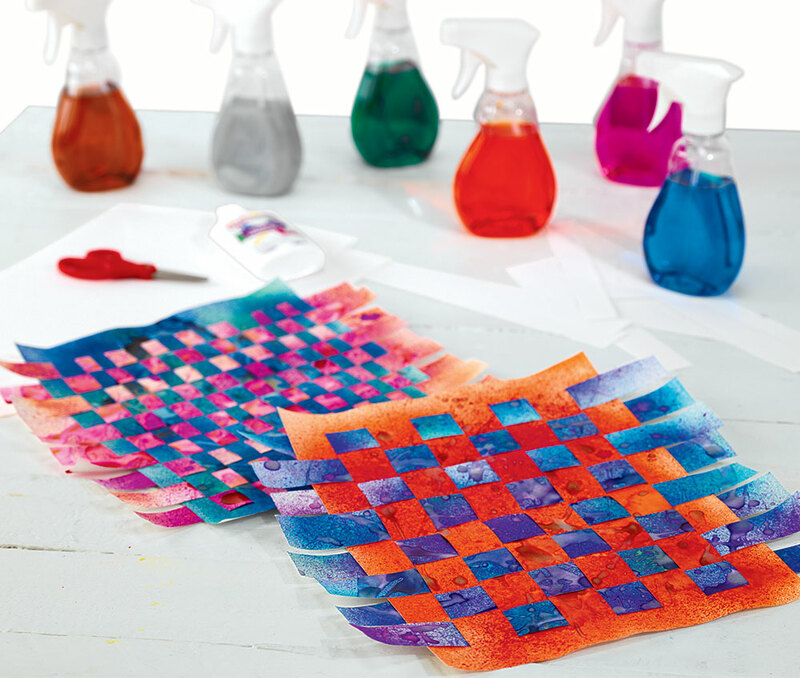 After adding Liquid Watercolor™ to sprayers, consider arranging the sprayers along a color wheel so that children can easily find complementary colors to use for their craft. Because this activity involves spraying and drizzling of paint, ensure that children have cleaning supplies available. This is a great activity for breaking out classroom aprons! Each child will need two sheets of art paper, scissors and paint in their desired colors. Provide each child with two sheets of art paper. One sheet will be the base and the other will be the strips. Spray two different colors of paint on each piece. Add metallic accents by drizzling Liquid Watercolor™ gold and silver accent swirls and dots over both sheets. Allow to dry overnight. Fold the base sheet in half and cut slits from the folded end to roughly an inch away from the edge. Cut the second sheet into full strips. Weave the strips in and out of the base. Glue the strips and base together at the edges to hold the strips firmly in place. This activity provides a great opportunity to discuss the history of weaving. Weaving is one of the most ancient forms of human artistic expression and has been used to create baskets and textiles for generations by many different cultures. For an interesting and visually pleasing contrast of colors, consider using warm colors for the base and cool colors for the strips. 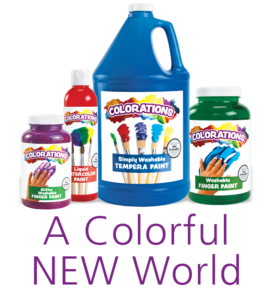 Or, have children use a color wheel to find and use complementary colors. You may wish to mount, hang and display your woven artworks. If so, glue your completed project onto a sheet of black paper. Then add magnets, strings or anything else in order to display your craft.